Sega and Creative Assembly announced that Alien: Isolation would be released on Tuesday, October 7th for the PlayStation 4 and PlayStation 3. Grip games (Atomic Ninjas, Foosball 2012) announced that they’ll be bringing Jet Car Stunts to the PlayStation in May 2014.No price or other features such as cross buy,save or play are known yet. BitComposer Games and Games Farm are bringing the Air Conflict series to the PS4.Air Conflicts: Vietnam Ultimate Edition will drop this spring at €49.99, and will come with new features and improvements based on community feedback. Watch Dogs the long awaited open world title from Ubisoft is coming on May 27th for PS3 and PS4.A new trailer released showcasing the amazingly created city of Chicago,which is the setting of the game. Developer Playrise and indie publisher Ripstone have announced that the mobile hit micromachines style Table Top Racing is coming to the PS Vita this Spring. 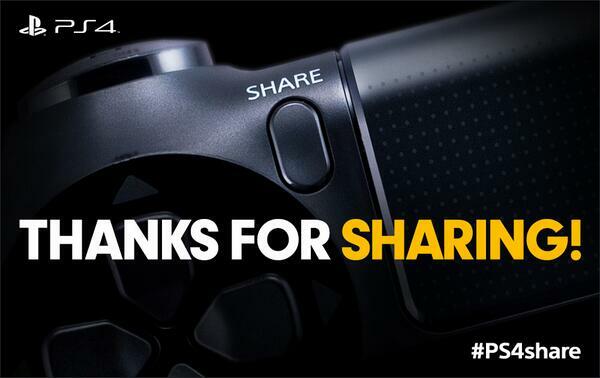 PS Vita System Update 3.12 coming soon,fixes the 32mb card issues? 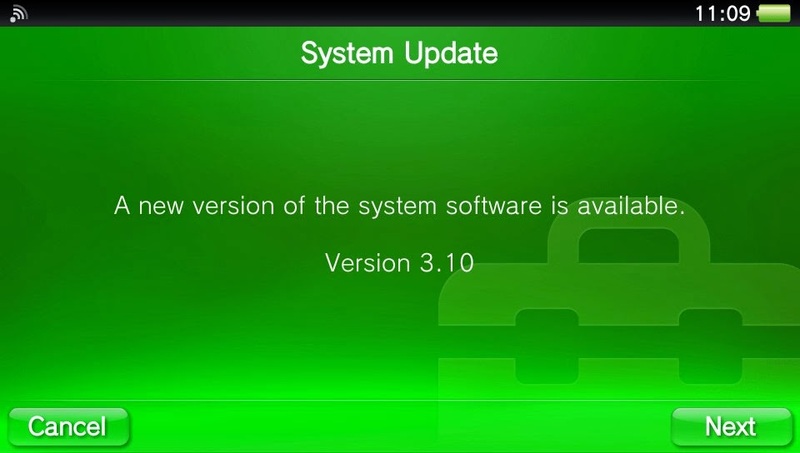 PS Vita System Software Update 3.10 is already available with some new welcome features but it seems that many users with 32 mb memory cards are experiencing annoying issues. 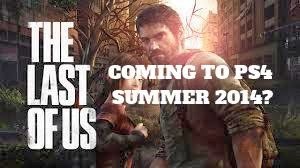 The Last of Us enhanced version coming to PS4 this summer? Sercan Sulun – PlayStation’s Eurasian Software Market Manager revealed on a interview to CNN Turk (watch here multiplayer.com) that The Last of Us enhanced version is coming to the PS4 this summer. 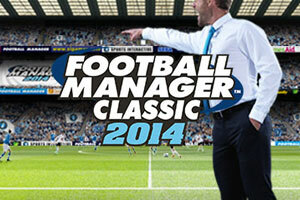 Sports Interactive finally announced the release date of the much awaited Football Manager Classic 2014.The famous football management sim is coming to Sony's handheld for the first time on 11th April. 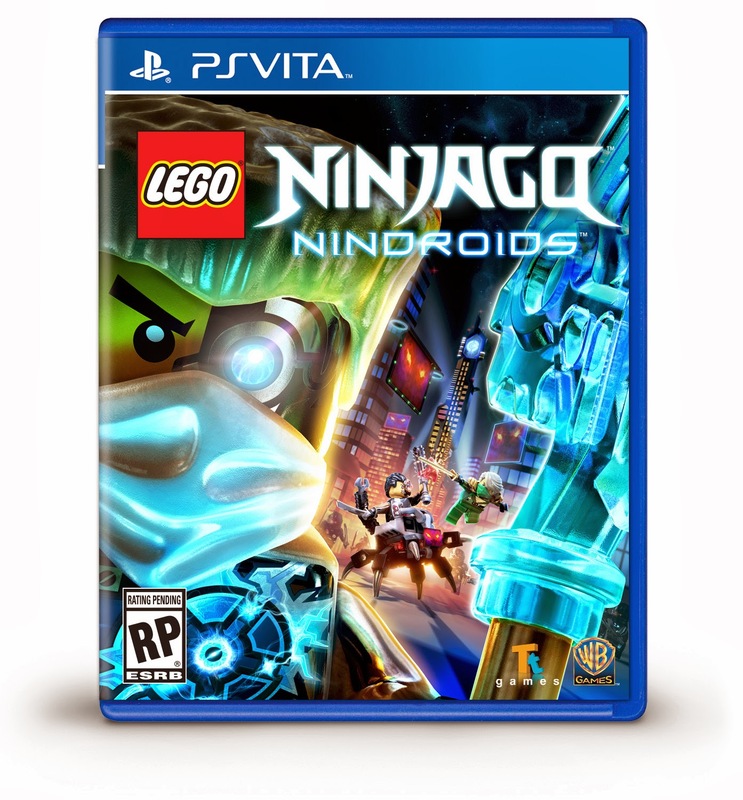 Warner Bros Interactive Entertainment have announced that a sequel to 2011′s popular DS title LEGO Battles: Ninjago titled LEGO Ninjago: Nindroids will be releasing for the PS Vita(and 3DS). Sony has just released a new major firmware update for the PS Vita,including the much wanted ability to display more than 100 applications on the home screen.All the new features with pictures. At GDC this week,Devolver Digital's Nigel Lowrie revealed in an interview to destructoid that the original Hotline Miami is coming to the PS4 with cross buy support. Oddworld: New 'n' Tasty is an upcoming video game remake of 1997's Oddworld: Abe's Oddysee (one of the greatest platforms from the PS one era) currently in development by Just Add Water to be published by Oddworld Inhabitants for PlayStation consoles in 2014 . Far Cry 4 will be released in the first half of 2015 and be set around the snowy mountain ranges of the Himalayas and Ubisoft will be officially unveil the game for PlayStation 4 at E3 2014. InFAMOUS: Second Son is already out for the PS4 and is being praised by most critics especially for it's true next gen graphics.But how good the game looks when displayed via Remote Play to the PS Vita OLED screen? Assassin's Creed Unity will release this holiday season on PS4 Ubisoft has announced. Football Manager Classic 2014 is finally coming to the PS Vita this April.The famous football management hit series debuts on Sony's handheld featuring the classic mode of the PC version. Tom Clancy's The Division a third person online shooter is one of the most promising next gen titles of the year.Powered by Snowdrop Engine the game will look fantastic.Snowdrop has been in development for five years and as you can see from the video below next gen graphics never looked better. 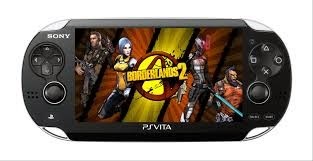 Finally Borderlands 2 version for the PS Vita is playable at Games Developers Conference 2014,so a few gameplay videos appeared with the highly anticipated shooter running on the handheld. SCE San Diego Studio’s MLB: The Show series already looks great on the PlayStation 3,but this year with the PS4 version the graphics will look like real life.The game will run at at 1080p and 60 frames per second and will be released for PS3 and PS Vita on April 1st and for PS4 on May 6th in North America. 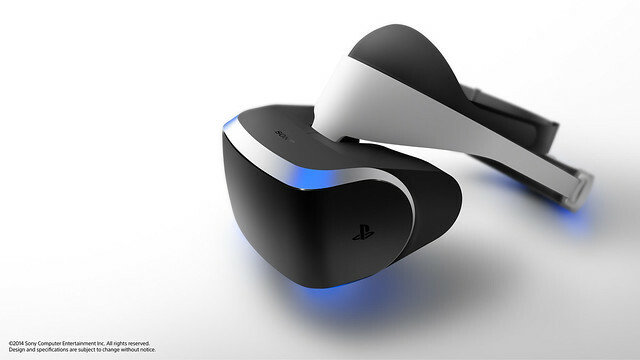 SCE Worldwide Studios President Shuhei Yoshida during the “Driving the Future of Innovation at Sony Computer Entertainment” panel at Game Developers Conference announced the virtual reality headset for the Playstation 4,a project called Morpheus. SCEA announced 6 new apps coming for the PS Vita.3 of them are already available and you can download them from the PS Store and the others are coming this Spring in NA.No news about European release yet. We all knew that Ground Zeroes will be a prologue Metal Gear Solid 5:The Phantom Pain but the game is too short.CVG posted a video which shows that you can complete the main mission in only 18minutes! 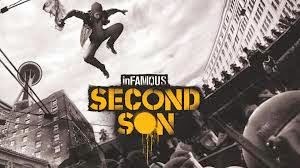 Infamous:Second Son PS4's first big exclusive title of the year is coming this week.But how the game looks on the Vita screen?How are the controls mapped on the PS Vita buttons? A two men team from Arizona called Team Colorblind are bringing their turn base strategy-beat em up game Aztez to PS4 and PS Vita sometime this year. 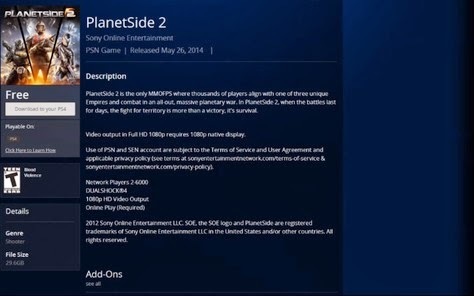 You tube user ElitePixelEnemy leaked a new gameplay video showing PlanetSide 2 running on the PS4.As you can see from the video below the game has great graphics and runs smoothly on Sony's console.But the most interesting part is that in the beginning of the video an image of the game from the PS store appears showing the release date and the size of the download. Race the Sun is an endless runner platform game developed by Flippfly and was released on August 19, 2013 for PC.Good news is that the game is coming this summer to PlayStation platforms featuring cross buy and cross save. Counterspy is an upcoming side-scrolling stealth game developed and published by Dynamighty.We already knew that the game was coming for PS3,PS Vita and mobiles but a PS4 has also been confirmed for a summer release. Congratulations to Media Modecule,Tearway won three BAFTA awards(Artistic Achievement, Best Mobile and Handheld Game, and Best Family Game). 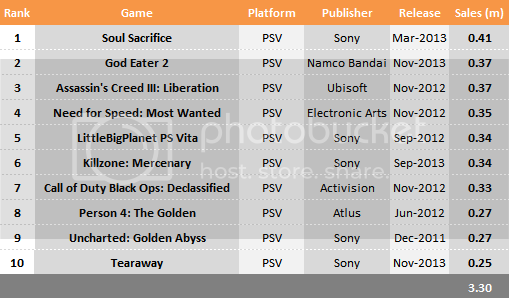 VGChartz released a list with the top 10 selling PS Vita games in 2013.Sales figures are retail only and not digital downloads. Kukouri Mobile’s 8 Million smash hit Tiny Troopers is charging to PlayStation.Tiny Troopers: Joint Ops will combine the original Tiny Troopers and Tiny Troopers 2: Special Ops into one game that uses dual analog sticks for control.Last years twin stick arcade game Total Recoil was a perfect fit for the PS Vita so Tiny Troopers will be a welcome addition. Tribute Games,an independent game studio located in Montréal announced that Mercenary Kings will be available for Playstation 4 on the Playstation Store starting April 1st in NA and April 2nd in Europe. Namco Bandai has confirmed that the once exclusive 3DS title in Japan One Piece: Unlimited World Red is coming to PS Vita and PS3 later this year in Europe and NA. Swedish indie studio named Arrowhead Game Studios are developing a top-down, 4-player shooter called Helldivers.The game will be released later this year on all PlayStation platforms.This multiplayer based shooter will also include a cross play mode for all versions so if you liked PS+ title Dead Naion this game is for you.Watch the gameplay footage below from Game Informer. The brand new videogame based on the MotoGP World Championship will be available from June 2014 on PlayStation3, PlayStationVita and on PlayStation4 for the first time. Free to play exclusive PS Vita Destiny of Spirits will be launching on March 25th in NA and one day later in Europe.The game is described as a fun and addictive RPGish strategy where the more friends you have around the world the better off you will be. Rocketbirds 2 Evolution the sequel to last years great co op shooter Rocketbirds:Hardboiled chicken is coming this Fall for PS4 with the PS Vita version to follow thereafter. It’s been a while since we’ve heard anything about Football Manager Classic 2014 for PS Vita since it’s announcement back in August. What we know so far about the game is that it will feature the 3D match engine, hundreds of different clubs to manage across various leagues and a cross save support with the PC version. After six months of delay Ubisoft officially announced that Watch Dogs will be available worldwide on May 27 for PS3 and PS4 including one hour of extra contest exclusively to the Sony's consoles. Guacamelee one of the best 2D action platformer for both PS3 and PS Vita is coming to the PS4.Super Turbo Championship Edition will contain all the original content and the DLC previously released.It will also have 20-25% more content will new levels,bosses and abilities as Drinkbox confirmed. 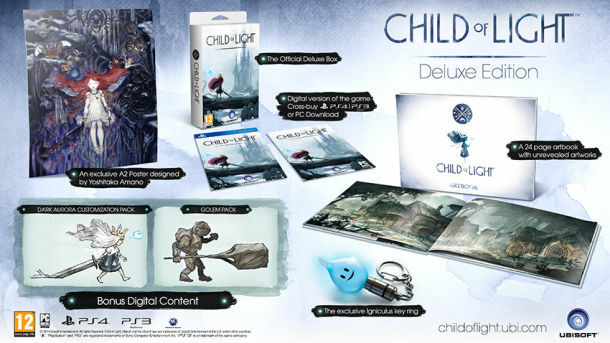 Ubisoft's Child of Light is a platforming role-playing video game coming at April 30th for both PS3 and PS4 supporting a cross buy option.It is interesting that it is the first time that a Ubisoft developed title supports the cross buy feature.